The military saw a 65 percent increase in mental-health diagnoses among active-duty personnel between 2001 and 2011, according to a 2013 study done by the Congressional Research Service. Cases of PTSD increased by 650 percent, according to the study, and more than 900,000 individuals were diagnosed with at least one mental disorder during that decade. The Navy study, led by clinical psychologist Kristen Walter, analyzes questionnaires answered by service members before, during and after a program of surfing one day a week for six weeks. The first group of 14 active-duty Marines and sailors in the six-week surfing program all had shown signs of major depressive disorder, some with signs of PTSD, researchers said. To the researchers, the initial results suggest that surfing can lead to a decrease in insomnia and feelings of anxiety, and a decline in an overall negative view of life and other symptoms of depression. The study, which began last year, will follow up with participants to check on their sleeping patterns and whether improvements in their mental outlook have been long-lasting. The study also plans to test the hypothesis that while hiking is beneficial, surfing is even more so. While some patients will go surfing, others will be taken on hikes. When the three-year study is complete, there will have been 118 participants in surfing groups and 43 in hiking groups. For physicians who have treated service members, the initial upbeat results are not surprising. “I’m a believer,” said Cmdr. Natalie Wells, preventive medicine physician and director of military population health at the Naval Health Research Center in San Diego. “It’s huge that Navy medicine is thinking outside the box,” said Betty Michalewicz-Kragh, an exercise physiologist at the hospital and director of the surfing program. Physicians in the military medical system and the Department of Veterans Affairs are hoping the study will prove that surfing is therapy, not just recreation. The surfing program at the Naval Medical Center San Diego began in 2008 when therapists were helping an Army staff sergeant from Hawaii whose right leg and right hand were blown off in Iraq. He asked whether he would ever surf again. Therapists took him surfing and, over time, were impressed as he regained strength and self-confidence. A second patient, a Coast Guard seaman whose leg was amputated in a motorcycle accident, joined the soldier. 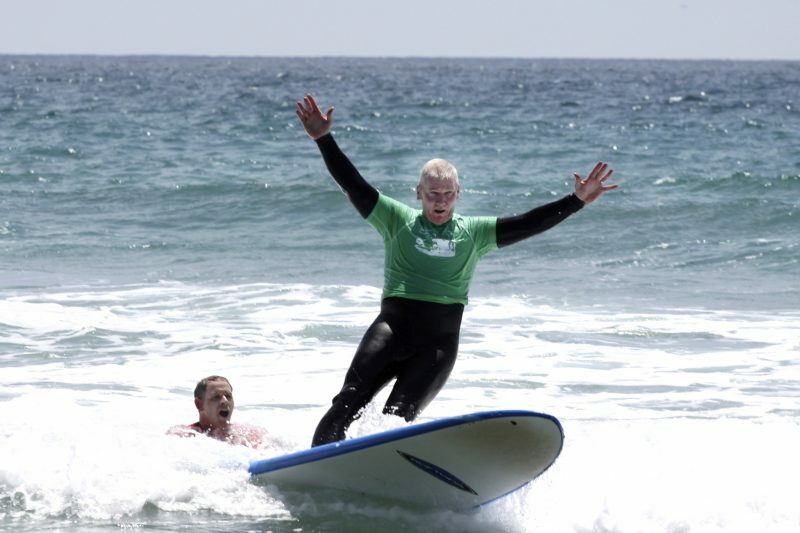 Soon a surfing program was created for other amputees and then for patients with mental-health problems. One of the surfers was Sgt. Maj. Brian Fogarty, a veteran of Iraq and Afghanistan. While Fogarty surfed, his PTSD service dog Blade, a 2-year-old boxer, stayed on the beach and watched. Fogarty will retire soon and join the PTSD Foundation of America. He plans to sing the praises of surfing. On most days, military members can be found on several beaches in the San Diego area. Nick Horin, 36, an Army staff sergeant and Iraq combat veteran, lives in the Aspire Center, a VA residential rehabilitation treatment site. He has been diagnosed with PTSD. A few days later, the latest participants in the San Diego hospital’s surfing program and the study met at the beach in Del Mar. One of the volunteers at Del Mar was Nico Marcolongo, a retired Marine major. Surfing, he said, helped him overcome PTSD after Iraq. He is convinced it will help others.